Logan Rowe is a grad student in the MSU Department of Entomology studying plants to support pollinators. Image: Project ICP. For farmers across Michigan and the country, pollination is essential for making their crops grow. For years now, they’ve kept a close eye on a key pollinator, bees, mainly because their numbers have been declining. Current State talks with Rufus Isaacs, a professor of entomology here at Michigan State University. 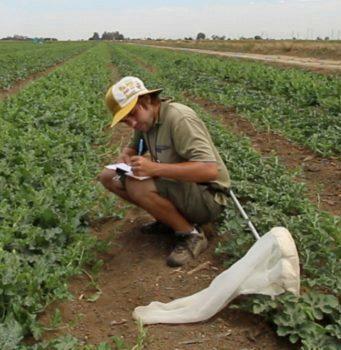 He has spent close to four years focusing on alternative pollination strategies, mainly involving wild bees. This story first appeared on WKAR’s Current State and is republished here with permission.